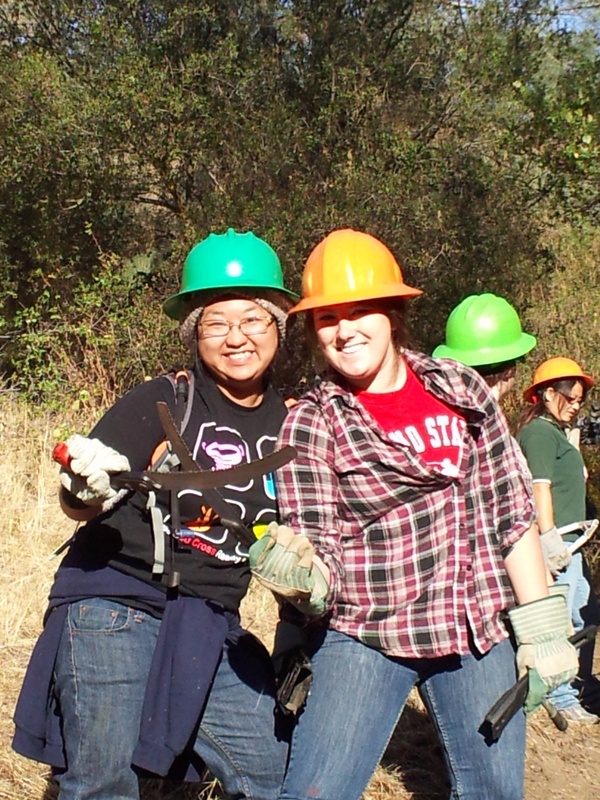 Me and Ambassador Alumna Heather Goossen (left) having fun planting trees on Make a Difference Day. Are you looking for a way to serve in the Fresno community? Lucky for you, Serving Fresno Day is November 21, 2015 from 8 a.m. to 12:30 pm. Serving Fresno Day is a local day of service encouraging people in the community to serve. Fresno State students, faculty, staff, and alumni have the opportunity to serve their community with one of three community benefit organizations. This year, Fresno State is partnering with Sierra Foothill Conservancy, Fresno State Plant Operations, and the Ronald McDonald House Charities of the Central Valley. To refurbish the Fresno State campus. To help build hiking trails with the Sierra Foothill Conservancy. To paint and work on beautification projects at the Ronald McDonald House. Volunteers are able to participate individually or as a group, they just need to fill out the Serving Fresno Day registration form. After you have registered, you will receive additional information about the event via email. Last year, I had a wonderful time volunteering at a similar event called Make a Difference Day where I planted trees at Woodward Park. I still remember this experience because when I go to the park I am able to appreciate the nature around me. It is interesting because most of the time people want to help others and do not think about volunteering to improve the community through nature beautification. However, this event made me realize that no matter what the service is, you can make a difference. There are hundreds of people that walk through the park every week and they are able to appreciate nature because of the help of volunteers. How do you serve Fresno? 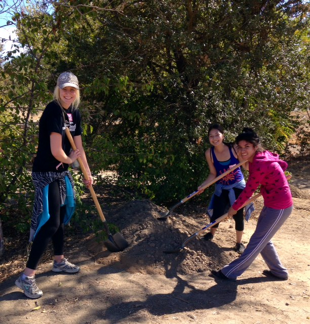 Ambassadors Heather, Nicole, and Jazmin working on the tree well project during Make a Difference Day. Make a Difference Day is a national event that promotes community service to improve the lives of others. 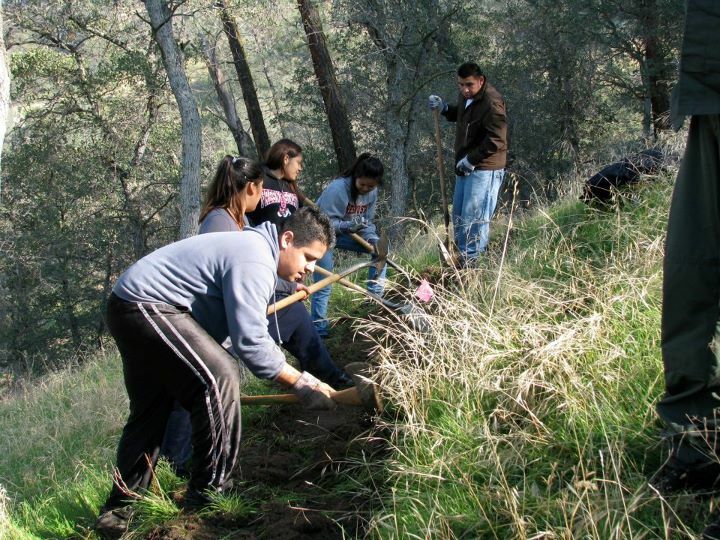 Fresno State collaborates with Fresno PARCS (Parks, After school, Recreational, and Community Service) and the Sierra Foothill Conservancy to create long-lasting projects that benefit the community. Since it was my first time volunteering at a Make a Difference Day event, I was very excited to lend a hand in refurbishing and beautifying Woodward Park. There were two tasks at this site: we repaired fences/barricades surrounding the park and created tree wells for tree irrigation. From my perspective, the highlight of the day was observing harmonious teamwork. Each individual contributed his or her greatest effort to the task at hand. As a group, we were motivated and willing to put in our best efforts to complete our objectives. I was thrilled to see new faces and meet other Fresno State students that also enjoyed community service. Although it was an exhausting day, it was rewarding to see how much we were able to accomplish in just a few hours. One day when I return to visit Woodward Park, I will not only be able to enjoy the scenic views, but also be more appreciative of all the work that goes into keeping the parks clean on a daily basis. After reflecting on this event, I realized that even the smallest things could be a part of something bigger. Each person was a puzzle piece, and by putting in time, energy, and effort we were able to all contribute to improving the park as a whole. I look forward to attending the next service event called Serving Fresno Day on November 22nd, 2014. I hope to see you there as well. What impact did Make a Difference Day have on you? How can you make a difference everyday? Will you be at Serving Fresno Day on November 22nd? The city of Fresno and surrounding population centers in the Central Valley are home to more than one million people. If all of those people took a few hours to give back to the community that they call home, it isn’t hard to imagine the profound benefits for the region. A group of approximately 50 Fresno State student and staff volunteers were able to lead the charge for this kind of change last Saturday, November 17th, at Romain Park in downtown Fresno. Serving Fresno Day was a chance for us as citizens of the San Joaquin Valley to show our pride in our community and do our own small part to make our home that much nicer. At our work site, the volunteers played an instrumental role in beautifying the area and instilling new life in the surrounding neighborhood; the scouring of bleachers and restrooms in the gymnasium and the digging of trenches for irrigation lines where trees will be planted proved to be wonderful projects for the volunteers. At the end of the day, there was tremendous excitement over the work that had been completed and seeing the grateful looks on the faces of the staff at Romain Park and the children that were there for a karate class made the whole day worthwhile! If you weren’t able to join the Richter Center on November 17th for a truly wonderful opportunity to share your time and love in the community that we call home, unfortunately, you missed out! But the good news is that the Richter Center is planning on partnering with Romain for service projects in the spring, so be sure to sign-up when those dates are announced. Join the Ambassadors as we make Fresno, our home, a place full of love for all; see you in the spring! As many of you might already know, Saturday, November 19th was Serving Fresno Day, a wonderful event in which our own Fresno State students were able to give back to their community while taking pride in all that we have here in Fresno. 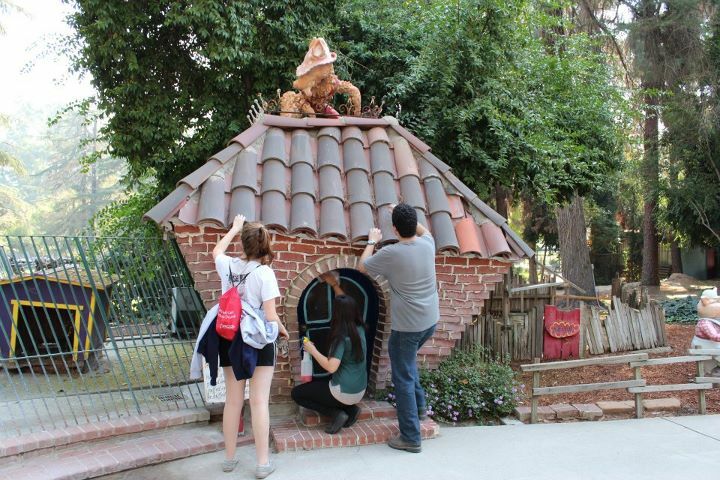 A group of students volunteered at Rotary Storyland and Playland, while another group helped the Sierra Foothill Conservancy clean up trails in the foothills. I was stationed at Playland, a small amusement park in the heart of Fresno where kids and their families can go for a great time. My job was to help repaint “The Octopus” ride, seen below. Others helped to repaint benches and “The Big Rocko” ride, and another group helped clean the deck near Shipwreck Cove. 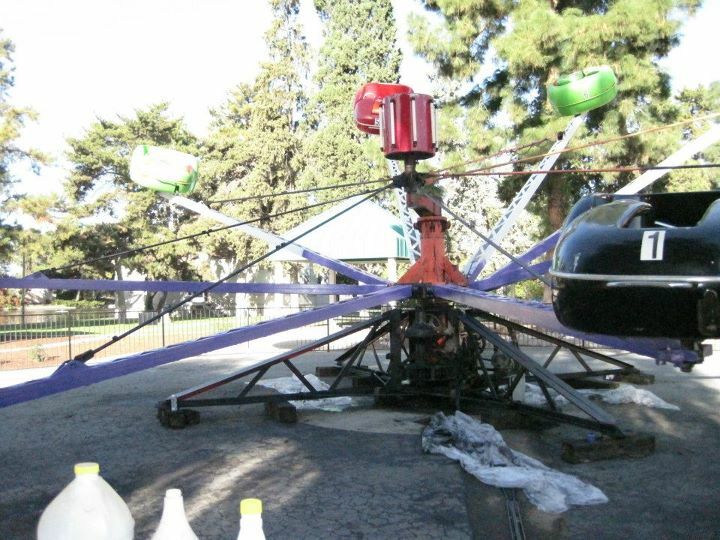 "The Octopus," one of the rides worked on by volunteers at Serving Fresno Day. It was a long process, but the results were very much worth it. Serving Fresno Day was a great experience that allowed me able to give back to the Fresno area while helping make the park a more fun and beautiful place for kids and families to be for years to come. It truly is incredible to be able to make a difference that will be seen and enjoyed by so many. Next time, I hope to join the Sierra Foothill Conservancy in restoring trails and making the foothills an even more beautiful place to visit. In the meantime, I look forward to volunteering with other Fresno agencies that give back to our community. With the season of giving coming up, here’s some food for thought: What are some of the ways in which you can give back to your community? Volunteers beautify an exhibit at Rotary Storyland and Playland. It’s almost that time of year again. The holiday season comes with a sense of gratitude. It’s all about slowing down a bit, spending time with family, and most importantly, giving thanks for the great things that surround us. What better way to kick off this season of giving than by joining in the efforts of Serving Fresno Day 2011? Join a group of fellow Fresno State students as they share their time and desire to help on Saturday, November 19, 2011. We will be working with our community partners, the Sierra Foothill Conservancy and Rotary Storyland and Playland. 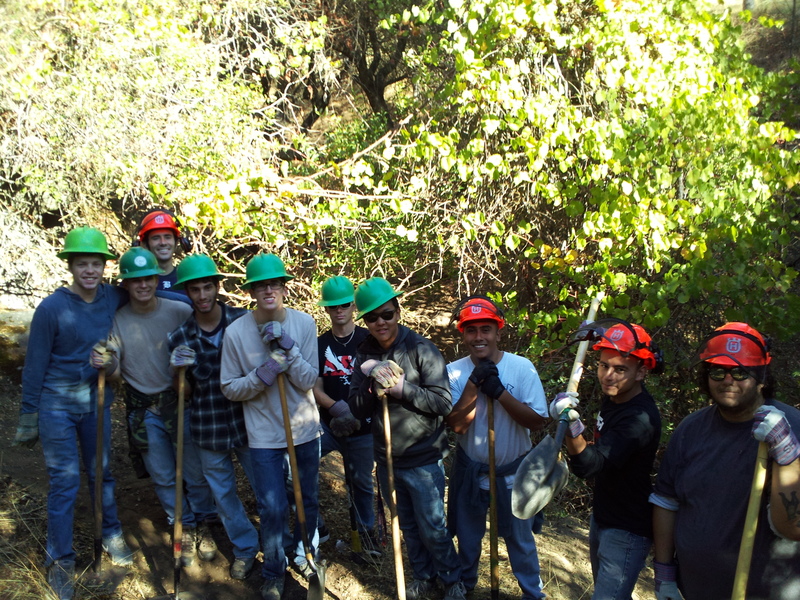 Volunteers clear trails with the Sierra Foothill Conservancy. Interested in helping? You’d better act quickly! Click here to register for this event by Wednesday, November 16. This is sure to be a great experience, and an awesome opportunity to give back.